This study, unlike most recruitment source research, tested for and ruled out the contaminating effects of prescreening and self-selection bias by examining applicants and new hires for nursing positions (S. L. Rynes and A. E. Barber, 1990). Consistent with the predictions of A. Rees (1966) and J. C. Ullman (1966), recruitment sources reached differently qualified applicants in terms of nursing experience and education which, in turn, were valid predictors of subsequent nurse performance. In a similar manner, recruitment sources produced sharply different levels of prehire knowledge, which was inversely related to voluntary turnover after 1 yr. However, contrary to both hypotheses, prehire knowledge, education, and experience did not mediate the relationship between recruitment sources and posthire outcomes. Recruitment sources with greater prehire knowledge did not always result in lower voluntary turnover. Likewise, despite recruitment source differences in nursing experience and education, recruitment sources were not related to nursing performance. 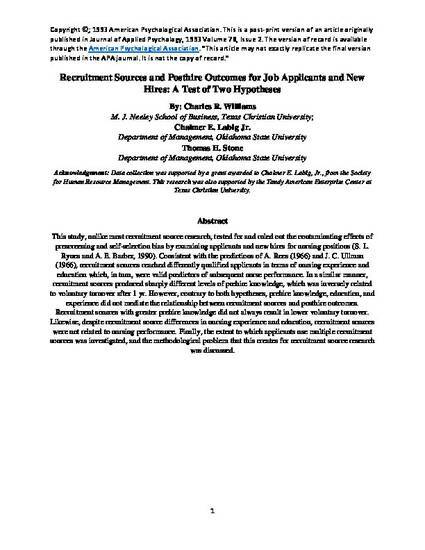 Finally, the extent to which applicants use multiple recruitment sources was investigated, and the methodological problem that this creates for recruitment source research was discussed. Copyright Â© 1993 American Psychological Association. This is a post-print version of an article originally published in American Psychology Association. "This article may not exactly replicate the final version published in the APA journal. It is not the copy of record."